Located on El Camino Real near Rte. 261 and I-5, Extra Space Storage serves Irvine residents near Tustin, Northwood, and Orchard Hills. Locals will recognize our facility a few minutes east of The Market Place and a few minutes west of Arnold O. Beckman High School. We're also accessible for residents of nearby apartments, such as Serrano Apartments, Montecito Vista Apartment, and Las Palmas. 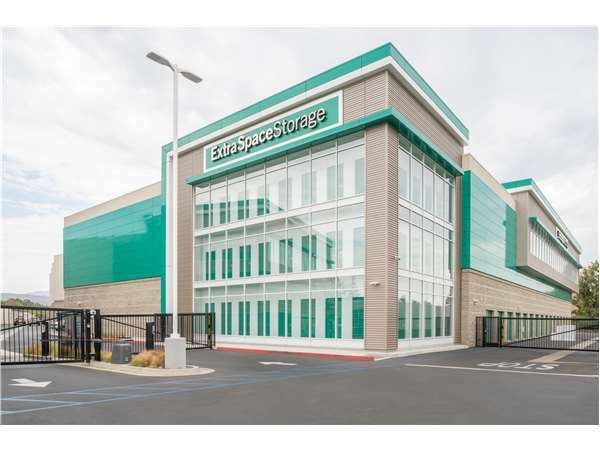 Extra Space Storage on El Camino Real has the self storage amenities you want, including climate-controlled storage, drive-up access, and exceptional security. We're your storage partner in Irvine! No matter what you need to store, our Irvine storage facility has the space you need! Unit sizes are available from 4x5 to 30x36 with features like indoor access, drive-up access, and more. With features like individually-alarmed units, 24-hour video surveillance, electronic gate access, and an on-site resident manager, you can confidently store valuable items at our El Camino Real storage facility. If you have temperature-sensitive belongings to store, climate control is the amenity for you! With climate-controlled storage, your unit stays between 55 and 80° at all times, preventing damage caused by extreme heat. These units come in sizes 5x5 to 20x20. Looking for more convenient self storage? With drive-up access, you can pull right up to your unit to unload and load items quickly. This amenity is also great for storing motorcycles, cars, and small recreational vehicles. Drive-up units are available in sizes 5x5 to 30x36. With affordable rates and top-notch amenities, Extra Space Storage strives to be the storage partner you can count. Our facility is always clean, well-maintained, and secure, and our friendly, professional staff is dedicated to providing excellent customer service. Contact us today to reserve a storage unit in Irvine! Extra Space-Irvine was terrific; the staff was great - especially Deneen! ... would use them again in a heartbeat. Thanks again Deneen! Great customer service at this facility. This place is very clean and ran professionally! We will recommend everybody. Great experinence. Make the whole process seamless. Excellent customer service! Great place , clean , great staff! The store manager was friendly and helpful as well as the rest of the staff. We found the facilities to be extremely clean and well maintained. The moving carts that were provided were lifesavers and greatly appreciated. The indoor units were climate-controlled as expected which helped since it was really hot when we moved. We would happily use them again! These units are extremely clean. Always have enough carts too. Great location. Clean. Wide isles. Helpful staff. Great rates for climate controlled units. Easy access to load and retrieve items after storing. Oh, and the access hours are early and actually close at some point providing additional security as I see it. Highly recommended. The location was close and in a upscale part of town. Thanks! Bloody bonzer mate, The service is a ripper, the space is great, the lighting is perfect. Crikey, you have got to see the height of the space. All is true blue. I love the facility, clean and accessible! I love the team at the El Camino Real location in Irvine, they are polite and willing to assist as needed. I've used them since about 2012...so happy I have them to turn to for help when needed. Thanks team! This place has had a rate increase every several times in just over a year. The manager a (new one again)if you question the price increase she does not get back to you when she says she will. And when she does the answer is like you just spoke to the hand. My last place never raised the fees for 10 years! The staff is awesome and the storage facility is very nice. Extra Space Storage in Irvine is clean, well maintained and the staff was terrific. I have used other storage units and none have compared to this one. The units are awesome with great elevator access. Very clean facility, extended access hours help tremendously, lighting in inside unit very helpful, carts are always available, the unit price is the best with the first month free. Personnel outstanding. You won't find a better Storage Company! Great service and reasonable prices!! I like the friendly staff, very well informed, you don’t have to asked question, they tell u all about it before you can think of a question. Very clean, easy and convenient to get to. The lady was really helpful and found the best solution for us. I enjoyed the excellent customer service she had given me. I love the tall ceilings for my surfboards reducing the overall space needed, and greatly reducing my overall expenses. Very smooth process in renting the storage space; facility is clean; staff is friendly and efficient. Everything is great so far and I expect that to continue. Everyone has been helpful and nice. I haven’t been there long but my experience has been great so far. I recently moved from one city to another, but hadn't made the time to pack up and move my storage unit until now. I was contemplating for a long time, but when I saw this new facility open near my new home, I knew it was time. They move in process was super easy -- I was able to research and reserve what I needed online, as well as chat before making my choice. Once I reserved, the facility called me almost right away and answered all of my questions. The price and size was exactly what I was expected and the final selling point was the late hours -- no one else provides access until 10:00 pm! This makes it so much easier to get to my unit when I need to. Jose and May were very helpful. Reinstated us after our account was closed for lack of use. Very friendly & helpful & easy to move in! A clean and secure place to store your belongings. It is also in an excellent location. Very grateful that this unit popped up. ExtraSpace Storage El Camino is a wonderful place for Storage because of its clean, climate controlled, price outstanding, and wonderful staff! Highly recommended when compared to 3 other facilities I checked out. I would highly recommend you check it out for yourself!!! Very clean facility and security seems quite good. The unit selections are very good and the pricing at this point cannot be beat. Good value for storage space. A new facility in a good location w/ a great special! The manager was very accomodating. Staff is very helpful. Clean, easy access, reasonable price . Employees were great. Melanie and Adrienne did a wonderful job. Recommendation would include talking with them. I had the great experience at this is storage facility. It is totally clean and the stuff is really friendly and professional. May made the process very easy and explain to me everything that I need to know. Great service from the start of the process..
Easy and quick. Great rates as well. When I first came in it was nice to have them let you see the space first before signing anything. Please rent from them. The auto payment service charged me for the following month after giving my 30 day notice online. I like the feel of your facility. The grounds are clean and green is a much nicer color than orange. Manager (Jessica) and employee (Billie) were very good to work with. Facility is nearby and is maintained in excellent condition.